“Hello, this is John Jones. I know we have called a number of times with ‘opportunities’ but this time I think we really have one,” John said excitedly as I answered the telephone early Monday morning before my first appointment. “That is good news,” I said. “Do you want to tell me about it over the telephone or come in for a sit-down meeting?” I asked. “I am fairly booked up, but this sounds like an important issue for you, I will forgo my lunch and meet with you. Can you be here at 12:00 sharp?” I said. “We will be there,” John answered. It was great to see both John and Jane again. It had been 3 months since our annual meeting, but it had been almost six years since we made many major changes to their policies or plans. I had made them promise when they were 33 and starting to accumulate a lot of cash in their policy cash values, they would talk to me before making any major purchases. Through the years there had been a few minor things, but nothing particularly significant. I made it a point to remind them that opportunities find those who are in a strong cash position. “Sounds good to me,” John said. “So we were approached by a friend over the weekend about purchasing his cabin. A cabin in the mountains is something we have dreamed about for a long time. Well, at least as long as we have known you. We would never have thought it possible without the whole truth you have taught us,” John continued. “Why is he selling the place?” I asked. “He owns a hardware store in town and really needs some capital to purchase inventory. His cabin was recently appraised at $150,000 but he is willing to sell it to us for $100,000 if we can close in 10 days,” Jane explained. “We’ve been there; it is a really nice place. In fact, I think it is worth more than $150,000 but that is what the appraisal valued it at 4 months ago,” John said. “They are going to be right around $200 each,” John said. “Great. 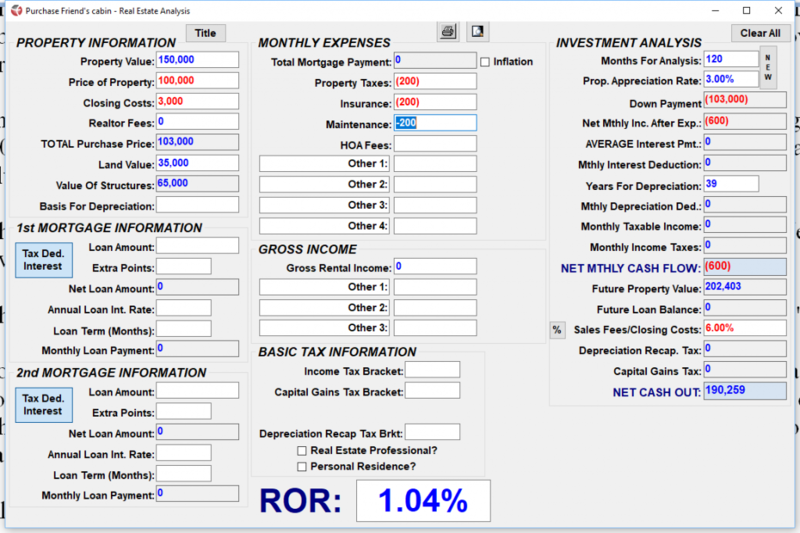 With this information, what is the rate of return on your ‘investment? '” I asked. I could see the excitement in John and Jane’s face leave. “Don’t worry, this is just a starting point,” I said. I want you to see the whole story. 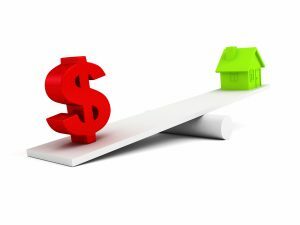 Besides many people say there are only three rules in real estate investing, ‘location, location, location.’ And I agree the location is critical, but I also add three more rules, which I normally put first; ‘financing, financing, financing,'” I concluded. “I was just going to ask you about that possibility.” I entered that and noticed they were staring at my screen to see how that affected the rate of return. “You’re right on target, Jane. That is an issue you need to keep in mind. But can you pay cash for this cabin?” I asked them both. “No, of course not,” John answered. “So we are going to finance the purchase, just as Jane was saying. Let’s take a look at the rate of return when we take a loan into consideration. Most likely a lending institution will want you to put 20% down and then finance $80,000. 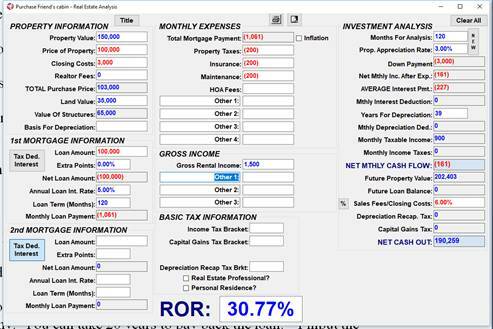 Let’s say you can get a loan with a 5% interest rate, amortized over 10 years.” I said as I input the numbers into the calculator. “But does the rate change to a value that is unattractive to you?” I asked John. “No, I am still interested in the cabin,” John replied, looking at Jane. She nodded her agreement. “Let’s make a few changes to our calculator,” I said. “You have policy cash values greater than $100,000. Why would you go to a bank and pay them the interest instead of using your own cash values as collateral?” I asked. “It doesn’t seem right,” Jane answered. 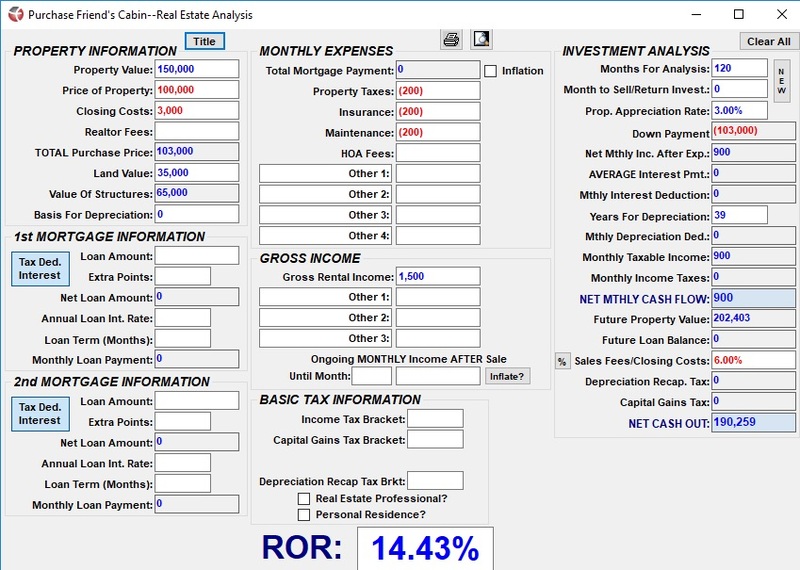 “I am going to input $100,000 and assume it is coming from your insurance company with your cash values as collateral.” I changed the numbers and showed them the calculator. “Let’s take a closer look,” I said. “Notice your monthly cash flow is now a negative number. How happy will you be to be paying $161 every month to keep the place going?” I asked. “We might be ok with it for a while, but it will grind on us, especially if we have a bad month or some unforeseen expenses,” John said. “That’s why a bank will not loan you 100% of the purchase price,” I said. “But this is not a deal killer. You must always remember you are the one in control. The bank will tell you they will only loan you the money for 10 years. And under that scenario, this does not make much sense. But, can you determine how long it will take you to pay back that loan?” I asked. “Um, I am not sure,” John said. “You are in control,” I said pointing at them. “You are the ones who determine the terms of the loan, not the insurance company. So could you take 20 years to pay back the loan?” I input the numbers as I asked. “That makes a huge difference!” Jane exclaimed. “The rate of return went up and the monthly net cash flow is not only positive, it is higher than borrowing 80% from a bank. ‘How is this a bad idea? '” Jane quoted one of her favorite movies. 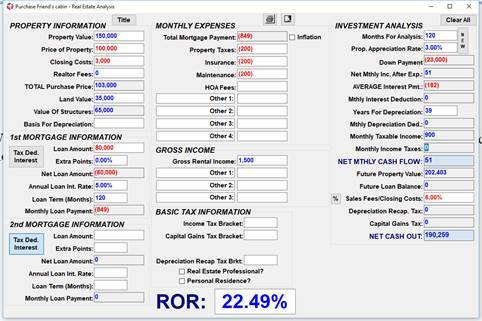 “Are you still in the 25% tax bracket?” I asked. 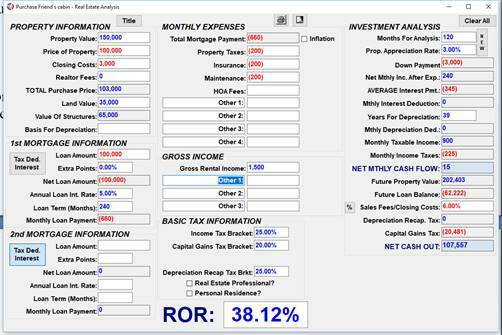 I input their tax bracket and the capital gains tax as well as the Depreciation Recapture tax bracket and hit enter. “Always have to pay Uncle Sam,” Jane said. “There is one caveat here,” John said. “And the reason we were so anxious to meet with you today. Our friend needs to have the money within a week or we cannot buy the cabin. Can we get that kind of money that quickly?” John asked. Reaching into my desk I pulled out a loan request form and handed it to them. “Just fill out this form and you will have the money within a week,” I reassured them. “Awesome!” Jane said. “That’s so much easier than I expected. And thank you. We will have to invite you up to the cabin sometime!” Jane said. As John and Jane left I was once again impressed by the power of being in control of a pool of cash to take advantage of opportunities. And I still had time to eat my lunch.